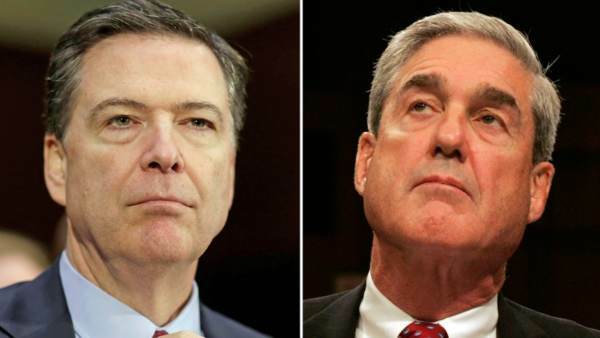 Dirty Cops Mueller and Comey Held Secret Meeting Before Comey Testified to Congress – For This Alone Mueller Should Resign! There are many reasons why the entire Trump – Russia investigation is a farce. One major reason is the fact that Special Counsel Robert Mueller and Former FBI Director James Comey have a relationship that taints the investigation. The fact that they met secretly before Comey’s testimony to Congress in June is enough evidence to contaminate the entire investigation. At the very least Mueller should have recused himself months ago. Back in May after crooked Comey was fired by President Trump, Comey was asked to appear in front of Congress. Comey however, postponed his meeting with Congress because he wanted to meet with Special Counsel and best friend Robert Mueller before appearing in front of the Senate. House oversight committee Chairman Jason Chaffetz said Wednesday he had a “one-on-one” conversation with ousted FBI Director James Comey earlier this week, in which they discussed Comey’s looming public testimony. The interview comes two days after Chaffetz announced he postponed his panel’s hearing related to the FBI’s independence scheduled for Wednesday. Judicial Watch also sent Acting FBI Director Andrew G. McCabe a warning letter concerning the FBI’s legal responsibility under the Federal Records Act (FRA) to recover records, including memos Comey subsequently leaked to the media, unlawfully removed from the Bureau by former Director James Comey. Mueller should have never accepted the job of special counsel due to his many conflicts of interest. He should have recused himself immediately after accepting the position. When he and Comey met secretly he should have resigned. Now he should be prosecuted for trying to overthrow duly elected President Trump and therefore the US government. Iran's Parliament Passes Vote Declaring US Central Command A "Terror Organization"
Enemies Within… Enemies Foreign And Domestic! Does RECENT DNA Testing at Stonehenge Validate My Theory?